Will I see whales, dolphins, sharks or puffins on the trip? Our trips to the Small Isles have regular sightings of dolphins, whales, porpoise and basking sharks as well as the Sea Eagles and Golden Eagles which are resident in our area. Both common and bottlenose dolphins are usually sighted and we normally have good numbers of minke whales during the season. Also we occasionally encounter more exotic animals such as Orca (killer whales), other whales, and Sunfish. 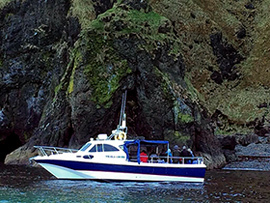 Our trips to Canna and Rum see Sea Eagles/Golden Eagles on most days as well as many other types of seabirds including Puffins, Manx Shearwater, Skuas, Gannets, etc. The Puffins nest on the Isle of Canna between late April and July/early August each year. Please see our guestbook comments for an indication of what can be seen on our trips. On the Cuillins/Coruisk trips, this is virtually guaranteed. There is a resident population of 150-200 seals many of which are hauled out on the rocks and islands beneath the mountains every day. 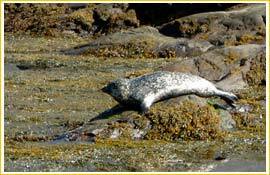 On the Canna, Rum and Eigg trips you are likely to see Atlantic Grey Seals and some harbour seals. Do I need warm clothing? Yes, please remember it is always cooler on the water so it's important to wrap up warm with several layers of clothing, unless it is a really hot day! Water/ windproof suits are provided for use on AquaXplore trips but not normally on Island Cruiser. Also please remember if you are walking ashore you need your own suitable clothing. 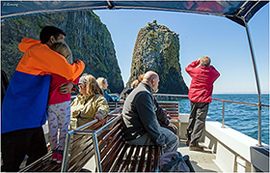 For AquaXplore we recommend a minimum age of 5 years but please do remember that the half day trips to Canna and Eigg in particular involve considerable time on the boat. 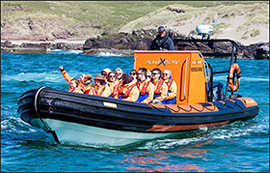 Our AquaXplore boats have 3 parent and child seats for younger children. Please ask us if you have any queries on the suitability of any trip. Island Cruiser trips are more suitable for families with younger children but again please remember the length of the trip. All our half day trips have discounted family tickets available. Do you have toilets and refreshments on your boats? We don't have toilets or refreshments on our AquaXplore boats but there are toilets at Elgol (by the upper car park) and on all the islands that we visit - Canna, Rum, and Eigg. We do have an onboard toilet on Island Cruiser. All the islands also have good cafe / refreshment facilities too but you can take a bag with your own supplies if you wish. If you wish to ensure your seats yes - due to limited seating, popularity and the range of trips and times offered. You can use our online booking form or telephone us (0800 731 3089 or 01471 866244). Some of our passengers do just arrive without booking but this can mean the trip going (or gone!) is already full or is not the trip you want. Please remember some trips board at 9am so early booking for these trips is essential. I only want AquaXplore and not Island Cruiser (or vice versa). Will I get the boat I want? Yes you should, and we will be able to most of the time. There may be some occasions when we cannot run the trip on the boat you want and then we will contact you to see if we can run the trip on another day or at a different time. It is always helpful if you can give alternatve days/times when you book and this also helps if there is poor weather. If you dont mind which then you don't need to tell us anything extra when you book. Our season for normal scheduled trips is April (or Easter if earlier) to October but if you wish to enquire about a trip or charter at other times please contact us. For individual trip departure times please go to "Boat Trips" page and then click "Book this Trip Now" - the relevant times will be displayed. How much luggage can I take? Can I take my camera? On scheduled trips one small back pack per person is fine. We may be able to carry additional luggage by prior arrangement. Cameras are welcome but we recommend always having a waterproof / splashproof case. For AquaXplore reasonable fitness/agility is required and you need to have independent seated balance. The seats are individual motorcycle-style pod seats which are cushioned and comfortable. Our passengers do range in age from the very young to the very old! On Island Cruiser there are normal bench-type seats and these trips are more suitable for those with any mobility issues. Please note that there are certain times on a few days when the tide is very low when there can be a big step down onto the boat or possibly using the ladder at the pier. If you have any mobility / acess questions please do contact us. We always endeavour to accomodate anyone who wants to take a trip with us. What if I am pregnant or have back problems? We advise that AquaXplore trips are not really suitable for anyone who is pregnant or who has back problems especially if conditions are anything other than calm. However if AquaXplore is not suitable for you we do offer the same trips on our Island Cruiser boat. We are sorry but AquaXplore trips are not really suitable for dogs, but we may be able to on Island Cruiser as long as your dog is well behaved. Yes, your safety and comfort is our main concern so it is sometimes necessary to cancel trips if we feel conditions are unsuitable. If you are travelling from far on the day of departure, we suggest you call us for an update on conditions. We will always endeavour to run trips as booked but very occasionally we may have insufficient numbers for a trip to run (although this is rare) and sometimes circumstances may arise which affect sailings. In this event we will always try to offer an alternative trip, or if you have availability, move your booking to another time or day. What happens if my trip is cancelled? If we have to cancel your trip we will refund any payment in full or, if you prefer, book you on to another trip when availability allows. What happens if I fail to turn up? Can I cancel my booking? If you have made a confirmed booking you will be charged for your booked seats. If circumstances arise where you wish to cancel your booking we will endeavour to resell your tickets but please remember that we cannot guarantee being able to do this, especially if it is only shortly before the trip departure. What if I am unhappy with my trip? We are sure you will enjoy your trip with us but if for any reason (apart from the weather!) your trip has not lived up to our usual standards we offer a full refund. What do you mean by "No-Hype / Straight talk" guaranteed? We know you want to be confident in what wildlife you will see and that you don't want to be misled by exaggerated or misleading claims about wildlife. We believe it is important to always truthfully tell our customers about the probability of sightings and we are committed to tell it straight and to not make extravagant or misleading claims about wildlife. I have a question which isn't covered above - Can you help me with this? Yes please contact us with any other question - either by email or by phone. Please see our Contact Us page.